I just wanted to introduce you, to those of us who do not know to the Cup of Excellence group. Scanning through their website on www.cupofexcellence.org the idea began 1999 when a group of coffee connoisseurs believed that Brazil had some really special coffees that kept on being unnoticed or disregarded, probably because although Brazil grows the most coffee in the World, their coffees are primarily used for instant coffee or if of good quality, blended with other coffees. In any case this group got together “cuppers” (expert coffee tasters) and they went through a few coffees and the best ones were selected, giving the Cup of Excellence stamp and auctioned through the internet. This practice continues today and now has 9 country programmes, mainly from Central and South America but with one exception, Rwanda in Africa. The coffees are very special, each with their own distinctive flavours, aromas, etc and are practically handcrafted by their grower and eventually auctioned off through the internet. The Cup of Excellence is now what may be known as the Oscars of the Coffee World. The coffees are bought by coffee connoisseurs all over the World, roasted by top specialists who want to give their customers the best highest quality coffee. Furthermore, the people who really benefit from this scheme are the growers themselves, who are recognised and financially rewarded, enabling them to plough back the profits into their business, leading to better education for their loved ones and impacting positively on their communities – Well done ! 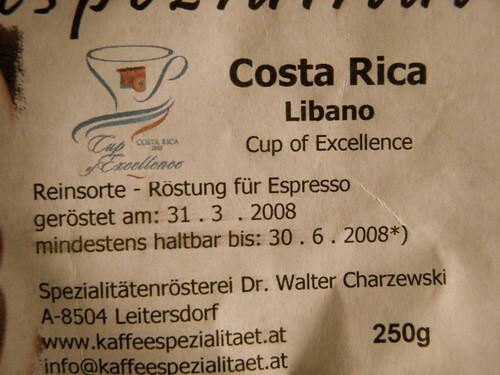 So, naturally, you can imagine that I was very excited when I got my hand on a Cup of Excellence Bag of coffee from the Costa Rica Libano coffee farm, roasted by a specialist in Austria. I checked out the coffee on the Cup of Excellence website, where it was described by the professional cuppers as “bright, honey, syrupy and dry fruit”. I was advised to use it for espresso, which I found sweetish, reminding me of the espresso I had at Flat White, Soho (London). It had a nice golden colour too, having not been dark roasted. 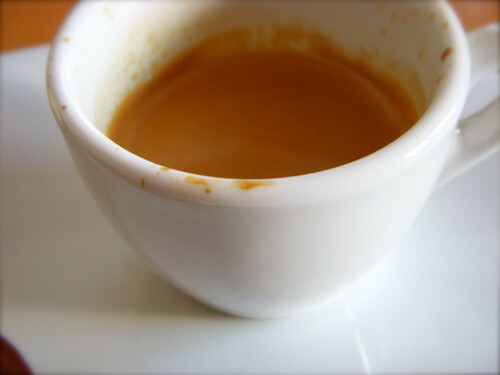 However, as far as I am concerned Central American coffees are excellent for espresso based milk drinks and I as soon as I used this coffee for a double espresso macchiato, it was FANTASTICO – Heavenly, Wow ! What a feeling. Naturally ! I only drank this wonderful coffee in the mornings when I tend to drink milk based espresso drinks such as Cappuccinos or Lattes. I think the price I paid, about 7 Euros for a 250g bag of beans was worth it, considering that I have spent more and it hasn’t been a Cup of Excellence coffee. So, next time you visit your specialist roaster, try and ask if they can get you a Cup of Excellence coffee, but not one that will break the bank. This entry was posted on Friday, May 2nd, 2008 at 6:03 pm	and posted in Bean Talk - Coffees, I'm Drinking. You can follow any responses to this entry through the RSS 2.0 feed.